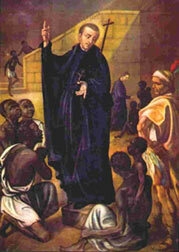 St. Peter Claver, SJ, was a member of the Society of Jesus and is the patron of African missions and of interracial justice, due to his work with slaves in Colombia. When a ship arrived, Peter first begged for fruits, biscuits, or sweets to bring to the slaves. He then went on board with translators to bring his gifts as well as his skills as a doctor and teacher. Claver entered the holds of the ships and would not leave until every person received a measure of care. Peter gave short instruction in the Catholic faith and baptized as many as he could. In this way he could prevail on the slave owners to give humane treatment to fellow Christians. Peter Claver baptized more than 300,000 slaves by 1651, when he was sickened by the plague. In 1654 Peter was anointed with the oil of the Sacrament of the Sick. When Cartagenians heard the news, they crowded into his room to see him for the last time. They treated Peter Claver’s room as a shrine, and stripped it of everything but his bedclothes for mementos. Claver died September 7, 1654. 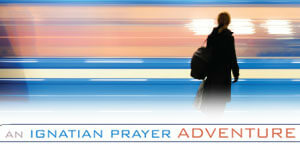 Video introduction to the life of St. Peter Claver, produced by the Apostleship of Prayer. Biography of the saint who influenced Peter Claver to consider service in foreign missions.